Exorcising the ghosts haunting his family’s vacation home leads one man into an odd relationship with a paranormal investigator. Paranormal activity leads artist Dan Papadakis, his wife Mary, and their son Jasper (‘Jazz’) to discover their mountain cabin vacation home is haunted. Modern hippie Joey Lee Dansing investigates and tells the family that there are two spirits in the house, but they are benevolent and should not be removed. Dan, Mary, and Jazz return to Los Angeles. Dan is unwilling to do nothing about the ghosts. Dan’s art dealer puts him in contact with paranormal investigator Oscar ‘Os’ Bijourn. Dan and Os go to the cabin. Os determines that the spirits are actually evil, identifying them as EFDs (Evil Fully Determined). Dan agrees to let Os exorcise the house. Os captures one of the two ghosts using a box trap and bait. He and Dan bury the box outside. As Dan and Os continue spending time together and getting to know one another, Os reveals that his wife is leaving him. Dan confesses that the black circle paintings for which he is famous have no real meaning. Os tells a personal story about supposedly encountering The Devil. Dan wakes in the night to find an old woman ghost in his bed with a tentacle tail between her legs. In the morning, Dan accidentally walks in on Os naked during a trance. Dan becomes increasingly uncomfortable with Os’ personality and their forced friendship. With Mary and Jazz on their way to the cabin, Dan fakes the second ghost fleeing the house in order to convince Os his work is done so he can leave. Dan briefly reconsiders as Os celebrates the exorcism by sharing his rare canned wine. The two men also hire a stripper. Os tells Dan that a feeling of possession indicates the old woman ghost returned. After four days together, Dan just wants Os to leave. Os realizes Dan doesn’t consider him a genuine friend. Dan reveals he lied about scaring away the second ghost because of his growing discomfort around Os. Os pieces clues together from family photographs and the black circle paintings and concludes that Dan’s family inadvertently opened a portal that resulted in Jazz becoming possessed by a demon. Dan tries throwing Os out of the house, but Os knocks Dan unconscious and ties him up. Mary and Jazz arrive at the cabin and Os restrains them. Unable to exorcise Jazz, Os resorts to burying Jazz alive. The old woman ghost appears before Dan and drops a key for his handcuffs. Dan escapes outside, rescues Jazz, and fights Os. As Dan beats Os, Mary arrives with the police. Dan and his family go to the hospital while Os goes to jail. Unusual problems require unusual solutions. And unusual solutions tend to be provided by unusual personalities. Dan discovers this firsthand when his family’s mountain cabin vacation home reveals two uninvited guests from the afterlife, one of whom is an unsightly hag with a bloody mass weighing down her lower jaw. Joey Lee, a paranormal investigator so informal about his trade that he dresses like the unkempt yoga instructor in line at Jamba Juice, says the spirits are benevolent and belong in the house. Kicking them out would be like giving the boot to a relative minding his own business in the basement. Dan doesn’t care. He wants a second opinion. That’s when Dan meets ghost hunter Os. Os’ investigation identifies the entities as EFDs, or Evil Fully Determined. Now this is a diagnosis Dan can get behind. Unfortunately, Dan now has to spend four days alone with the odd man while they work to exorcise literal demons. And Os uses the opportunity to unburden himself of some figurative demons by cornering Dan into a forced friendship of circumstance. Os is the type of guy who mostly means well in spite of social awkwardness, so Dan can’t really be upfront about his annoyance over the man’s intrusive presence. Tolerance turns into a bit of brotherly bonding for a time, but a point comes when Dan’s discomfort outlasts Os’ welcome. Trouble is, Os isn’t willing to leave until the ghosts do. “Another Evil” is the feature film directorial debut of Carson Mell, whose credits include penning several episodes of the TV series “Eastbound & Down” and “Silicon Valley.” Don’t expect a similar sort of broad laugh comedy, however. For that matter, in spite of its premise, don’t expect a typical horror film, either. In fact, don’t expect anything typical at all. 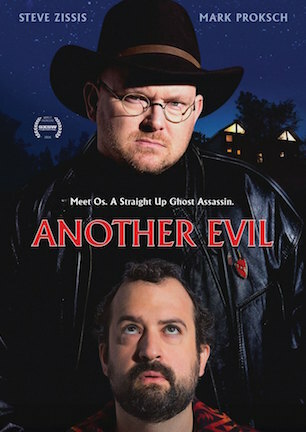 “Another Evil” is a character-driven dramedy about an uncomfortable union between two unlikely men, riding a mild-mannered mood somewhere between the lunacy of “What About Bob?” and the chills of “Creep” (review here). The film is more quietly quirky than either of those examples though, mixing a peculiar blend of dark drama, calm comedy, and a hint of horror that doesn’t play nice with easily categorized labels. Its subdued style means “Another Evil” is not the type of movie likely to garner strictly binary responses of “love it” or “hate it.” Like Os, the film takes some getting used to, and requires spending time soaking up its unorthodox company before forming an opinion. Even then, you still might not be entirely certain what to make of it. Yea or nay opinions hinge on how well one relates to the understated complexity of Os and Dan’s symbiotic arc. That in turn comes down to personal preference for their personalities, as co-leads Steve Zissis and Mark Proksch give everything they’ve got to make casual characterizations compelling. Writer/director Carson Mell’s exploration of Os and Dan’s uneasy alliance is an experiment in character study through casually dry humor. They are an odd couple, but they are not Oscar and Felix. The droll dichotomy between them births introspection instead of hijinks. You won’t find the “Curb Your Enthusiasm” theme playing underneath anything onscreen here. The start is slow. Aside from an occasional curl of a corner of my mouth, I didn’t fully laugh until about the half-hour mark, as it takes that first third of the film for the tone to sink in. The deliberate demureness of its comedic touches makes “Another Evil” an acquired taste blocked by design from mass appeal. The interest level of an impatient audience thus waxes and wanes in step with a tight two-person interplay taking its time to unfold. Particularly down the back third when, having developed their relationship as far as it can go, the film slows again down the denouement before breaking into an unexpected climax likely to leave some nonplussed at the resolution. As already indicated, don’t look at “Another Evil” as a horror movie. And don’t go in looking for laugh out loud hilarity. Think of the film as the moviegoing equivalent of catching up on the couch through conversation over a beer. “Another Evil” is that kind of a restrained experience. March 13, 2016 by Ian Sedensky.